Alex Ovechkin was the big individual winner at the 2008 NHL Awards Show. 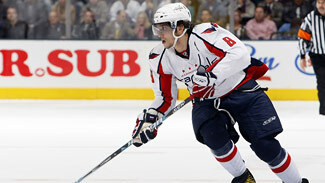 Ovechkin took home the Hart Trophy and the Lester B. Pearson Trophy. NEW YORK – The National Hockey League (NHL) today announced that its annual awards celebration will take place in Las Vegas June 18 and will serve as the inaugural event of a three-year agreement with the Las Vegas Convention and Visitors Authority (LVCVA). The 2009 NHL Awards, the first ever to originate from Las Vegas, will be broadcast live from the Pearl Concert Theater inside the Palms Hotel Las Vegas on VERSUS in the United States and CBC in Canada. "Las Vegas specializes in shining the spotlight on outstanding performers," said NHL Commissioner Gary Bettman. "Its innate energy offers an exciting setting for our celebration of excellence." This year's event will bring together more players, celebrities, business partners and fans than ever and will provide more opportunities for all to participate in the celebration. Fans will be able to purchase tickets to attend the NHL Awards. Tickets to the 2009 NHL Awards will go on sale on Tuesday, March 24 at Ticketmaster.com and at the Pearl Concert Theater Box Office. "We are honored to welcome the NHL Awards, and look forward to having the League's top players and loyal fans take a break in our wonderful city," said Terry Jicinsky, Senior Vice President of Marketing for the LVCVA. "Millions of people enjoy our sports and entertainment offerings every year, and having such a special celebration gives them one more reason to visit Las Vegas." "We are so thrilled to be the host of the 2009 NHL Awards," said Palms Owner George Maloof. "Working with the National Hockey League in bringing this event to Las Vegas is something that will be great for our community." As part of the agreement, the NHL and the LVCVA are holding an "NHL Awards Vegas Getaway" sweepstakes to give fans the opportunity to celebrate alongside some of the NHL's biggest names by providing a trip for two to the 2009 NHL Awards. In addition to two tickets to the 2009 NHL Awards, the winner also will be awarded two tickets to the exclusive after-party, roundtrip airfare and accommodations for two nights. Fans across North America can enter for a chance to win at NHL.com/Vegas beginning March 15 through May 10. The 2009 NHL Awards will feature announcement of the League's top regular-season performers in a host of categories including most valuable player (Hart Trophy), outstanding goaltender (Vezina Trophy), outstanding defenseman (Norris Trophy) and outstanding rookie (Calder Trophy). More details regarding the 2009 NHL Awards festivities, entertainment, ancillary events, broadcast details and media information, will be announced at a later date.